Julia and Me in Elle Magazine! In what ranks as possibly the most unlikely statement of an outrageously lucky career, Julia Roberts and I are in the September 2010 issue of Elle Magazine. 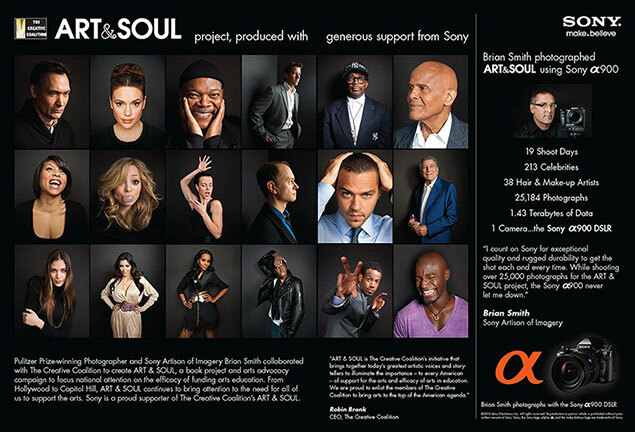 Julia is on the cover where she belongs but the massive 562-page issue also spotlights my celebrity portrait photography for Art & Soul photographed in partnership with The Creative Coalition with generous support of Sony. The spread in Elle previews a few of the images of creative artists Jimmy Smits, Alyssa Milano, Samuel L Jackson, James Denton, Spike Lee, Harry Belafonte, Taraji P Henson, Portia Doubleday, Debi Mazar, David Hyde Pierce, Jesse Williams, Tony Bennett, Dayna Mendoza, Kim Kardashian, Kerry Washington, Miss J Alexander, Marlon Wayans and Taye Diggs in the project that showcases the importance of support for the arts and arts education. BIG THANKS to all the Creative Artists who have lent their voices to this cause and to Sony and Hachette Filipacchi Media U.S. for their support! Thanks Jules, you are so sweet! I’m with rainny on this. NICE! So fun to see the new pix. Big congrats to you. you capture with each subject! A visual novel. Thank you Mary Lynn. You give me much too much credit. Sony had a lot of people in mind when they developed the a900 and I’m just lucky to have been in the loop. Love to you and David and wishing Hurricane Earl isn’t an uninvited guest on Erica’s a fabulous wedding day! Very strong images for a excellent cause. Nice job as always. Congratulations Brian! The Art & Soul Project seems to have legs as long as Julia’s. so glad it’s such a success! Congratulations!! You do Mizzou proud! This is fabulous!